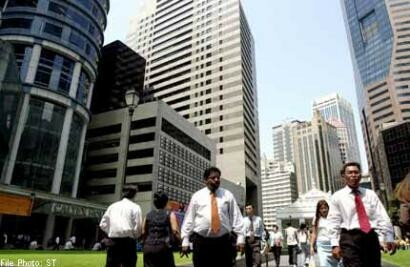 Singapore - STJobs.sg conducted a survey last month to determine the stress levels of people, with a focus on various job industries they work in. It was found that for every person who is stress-free and happy, there are 2.5 persons who feel stressed and 6.5 persons who are neutral (with manageable stress levels) and have work-life balance. This seems to attest to the recent survey results of SHRI's (Singapore Human Resources Institute) National Workplace Happiness Survey 2014 revealed on Tuesday (Nov 11), which stated that the nation's overall workplace happiness index is 59, which falls into the band "Under Happy", between "Unhappy" and "Happy". Out of close to 7,000 people surveyed by STJobs.sg, it was found that those who felt most stressed were those from the Legal industry, especially those who had recently graduated. For those aged between 46 to 65 years, the ones who suffered the most stress worked in the Property Management, Consultation and Facility Management industries. Those who are in the Arts, Culture and Entertainment industries were the most stressed group of people who received the lowest pay. Faizal Abdullah, 30, the artistic director of local theatre collective Hatch, said, "Working in the arts requires a lot of passion, hard work and dedication as jobs can be seasonal. There is stress in every job, but I think the stress is less if you're doing something you really love." With regards to receiving the lowest pay out of all industries with stressed people, the theatre practitioner of seven years added, "Other than having grants and support from the government, we could do with more public support. If more people are willing to spend money to watch local theatre shows, then we can probably earn more." Amongst all those surveyed, it was also found that 80 per cent of people who work in the e-Commerce and Digital Media industries are "hanging on" with manageable stress levels or enjoying work-life balance. "In general, there will always be a certain amount of stress as we are in a monthly production business that has strict deadlines. However, ours is an exciting business and it keeps everyone on their toes, so you could say it's 'good stress'. For me, I de-stress by going for cycling sessions on my free days to refresh and refocus," says Michael Ong, 36, COO of e-commerce site Bellabox. In agreement is Shireen Ho, a Senior Business Development Executive who works at one of Asia's fastest growing online fashion retailers. "Our work can be challenging as we always have to be 'on the ball' and results-driven. Having said that, it can be fun and we get a sense of satisfaction when we see fruitful results," said the 29-year-old. Workers in the Consumer Products and FMCG industries were split between being the most stressed and happiest. Bernard Tan, 31, a merchandiser who has been in the industry for 4 years, said he was happy to be in the FMCG industry. "It is a good learning ground because I have exposure to a diverse range of products which are constantly being innovated," he said. As for those who seem to be 'at ease' in their workplace in Singapore - 3.51 per cent of them are made up of fresh grads working in the electrical, electronic and mechanical engineering industries.